Hans Rosling died earlier today (Tuesday, February 7). He championed the idea of showing people what the world was really like – and how it was different from their preconceptions – using data and visualization. And he did it with enthusiasm and humor. This is a brief appreciation of his work and legacy. I still remember the shock when I first saw the video of his first TED talk in 2006. This was the first time I had seen somebody tell such a compelling story based on numbers. What is more, the numbers weren’t just in the background somewhere, they were front and center. Rosling was not the first one to use numbers and visual representations to show people data. But most research in visualization was (and still is) centered around analysis. Here was somebody using visualization to present, to educate, and to entertain. Who knew you could even do that? I initially hated TED's tagline The Best Stats You've Ever Seen, but it does make sense. If you haven’t seen this video, you have to watch it. And if you have, watch it again! I’ve easily seen it two dozen times now, and there are still things I discover every time I watch it. The original gapminder software he used in that talk was remarkable because it provided a number of interactive data visualizations on the web at a time when this was just starting out (this was before Many Eyes and many years before D3). But even more, it was a fully scripted story! The old Human Development Trends software is still available, though it requires Flash and is clearly showing its age. But it still is the most elaborate data story I know. It's both impressive and depressing that it hasn't been topped in the ten years since. Others have used data to educate people about the world, most notably Otto Neurath and his ISOTYPE Institute. But nobody had done this sort of performance before. The only comparisons I can think of are people like Carl Sagan, Neil deGrasse Tyson, and Bill Nye, who have done amazing work popularizing science. Like them, Rosling was a champion for a rational view of the world, but one infused with humor and humility. One thing Rosling kept telling people is that things are much better than you might think. There is no such thing as the Third World anymore. The world is improving at a steady pace. It’s hard to get this things into people's heads, and it's not easy to appreciate these facts when seeing all the negativity that often seems to dominate the news. Here is a fun exchange between Rosling and a reporter, where he schools him on the things that are good and improving in the world. That TED video has been watched over 11 million times. Eleven. million. times. A video of a geeky old professor talking about public health numbers! Many more have probably seen his BBC documentaries, like The Joy of Stats and others. I know many people who were inspired by Rosling and gapminder. There is a good number of visual and data journalists today that would not be in this profession had it not been for Rosling's enthusiastic presentation and embrace of statistics. He definitely had a huge influence on my thinking and work. I would bot be where I am right now if it hadn't been for his work. There would be no Tapestry conference, either, and not just because of me – his work was a big part of the inspiration to launch it. How do you make people care about data? As Kennedy Elliott pointed out on Twitter, Rosling demonstrated the importance of a human voice in visualization. He also used props: apples, rolls of toilet paper – he even swallowed a sword at the end of one of his talks. This is how you make people watch, and this is how you leave an impression. The picture at the top of this article was taken when Rosling gave a keynote talk at the Tableau Conference in 2014. It was amazing. He talked both about numbers and about some very personal details. And he wielded this long pointer, connecting him with the displays of the data. So simple, and yet so effective. 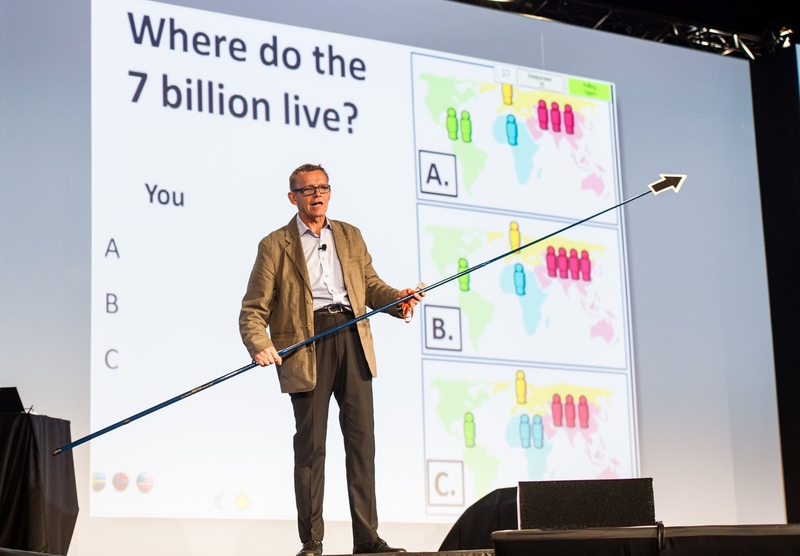 Hans Rosling was the face of gapminder, and an incredibly effective communicator. He understood how to get people's attention, and he was funny, humble, and human. Gapminder is not just Hans Rosling, of course. His son Ola and Ola's wife Anna Rosling Rönnlund are carrying the torch, and they are working on many interesting projects. The gapminder website has a collection of videos and interactive applications. But more than that, I think his legacy is the inspiration to keep educating people about the world with data. As much of a cliché as it is to say that this is needed now more than ever, it's true. It is needed now more than ever. And it will be needed in the future. People need to know. They need to understand. But they also need to care. Numbers alone won't do that, but perhaps a humble, human, and yet clear and principled way of showing and explaining data will. Teaser image credit and copyright: Rod Mar Photography, taken at Tableau Conference 2014.